A wide range of telehealth interventions could be used to optimize pulmonary rehabilitation delivery and patient outcomes. This includes monitoring of physiological signals or symptoms, early notification of clinical deterioration, telephone support, web-based education programmes; case management via videoconferencing and direct supervision of rehabilitation sessions. Telehealth interventions could enhance the delivery of comprehensive care, as well as improving access to pulmonary rehabilitation services for those cannot travel to centre-based programmes. This chapter reviews current evidence and existing models for telemonitoring, tele-assistance and telerehabilitation in chronic respiratory conditions. Tele-assistance has proved most successful for long-term, intensive management of the sickest patients, using sophisticated monitoring systems with high level support from an experienced clinical team. Effects of telemonitoring alone have been inconsistent across studies and the clinical, economic and organizational benefits are not yet clear. 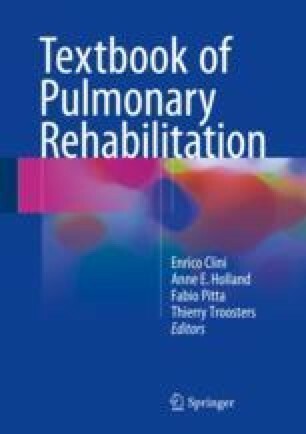 Telerehabilitation shows promise for delivery of effective pulmonary rehabilitation either to satellite centres or directly into the patient’s home, using a variety of approaches including telephone calls, videoconferencing, internet platforms and smart phones, although well controlled data are lacking. Future challenges include identifying the best candidates for telehealth-enhanced pulmonary rehabilitation across the spectrum of chronic lung disease; deciding when it should be delivered and for how long; standardizing models of telehealth to allow consistent implementation and meaningful comparison of outcomes; and articulating the health economic benefits of telehealth services.